Even couch potatoes can find the motivation to train for a marathon. Okay, so you decided to get off the couch and train for a marathon. The good news is you don’t have to run the 26.2 mile footrace or look like a Greek hero in spandex. It’s totally legit to walk a marathon, but it takes more effort than readjusting your position on the couch. So be realistic about what you can do in your current physical condition. You might not be ready to walk a marathon three months from now, but you can continue to train for the next year. It all begins with motivation -- and setting down the remote. Find your motivation. Because a marathon is no casual event, you have to know exactly why you want to walk and keep that motivation lit like a flame. Even ordinary women can walk great distances, such as the annual Susan G. Komen 3-Day endurance event to end breast cancer. Ask for support. Training may take as long as a year and you need the support of your family, friends and even co-workers. If you’re a twosome, ask your other half to harass you if you try to settle back into being a couch potato. 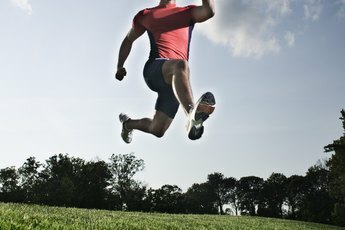 Sign up for a running group. You might be surprised at how much support exists for novice marathoners. Running stores often have clinics and group walks; big marathon events have group meetings in their area; and local hospitals sometimes offer group support for people wanting to exercise more. Carve out time. Just like “T.V. Guide” lists prime-time shows, your training requires a weekly schedule. Now that you’ve given up the couch, you’ll have more free time to train consistently, which should be three to five days a week. Step back in the saddle. If you fall off your training schedule, don’t give up. Just like getting bucked off a horse, the sooner you ride again, the sooner you overcome your fear of falling. Visualize the finish line daily. Create a mental picture of you walking boldly across that marathon finish line to the cheers of thousands. Visualization prepares the mind for success to follow, and you can transform the couch into your leg stretching and visualization station. Prepare for pain. Your muscles are going to get sore, and you might be tempted to return to the couch. Stretch, take a hot bath and give your feet a rub-down without giving into any negative thoughts. Take a day off. Consistent training takes at least three days a week. Your body and mind both need time for rest and recovery, so include time off in your training schedule. Cross-train to stimulate the brain. Not only is it good for your muscles to do other activities, it will keep your mental muscles fresh, too. You can swim, bike or row 45 minutes one or two times a week. Stay positive. Just as physical training is not easy, neither is mental training. Keep focused on your motivation and your goals as if they were an umbrella and your doubts and discouragement were rain. Set your goal. Your marathon goal needs to be clear, achievable and connected to your motivation. Write down your goal in multiple places, like a sticky-note taped to your bathroom mirror. Create a training plan. Along with your schedule, cross-training activities and recovery days, include nutrition and hydration in your plan because you are feeding and watering a more active body. If you are new to marathons, seek tips and training guides from the organizers of the marathon you plan to walk or join a local marathon-training group prepping for that specific marathon. Get shoes made for walking. 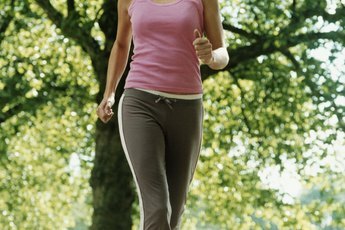 Get fitted with proper walking shoes, and replace them when they wear out. Don’t just buy name brand shoes off the rack or online. Find a running store and talk to the store’s shoe specialist about your goals and training. Track your miles. Start with a reasonable distance and time goals for your current coach potato status and gradually increase your mileage per week. Be patient because it takes about six weeks for your body to adapt to the off-couch rigors of training. Manage your miles. Because a marathon is a distance event, mileage is your goal. 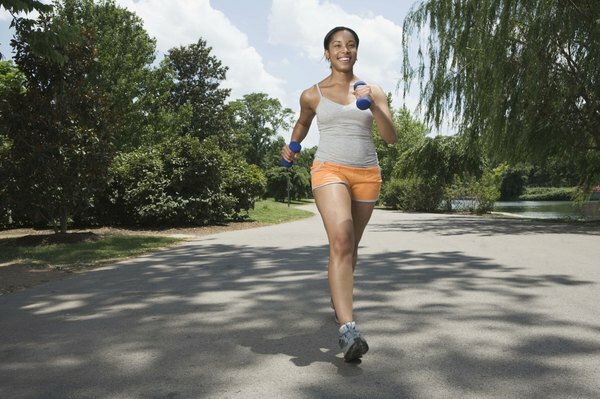 Increase your walking distance by 10 percent each week to gradually increase your mileage. Every third or fourth week, you need to slack off -- just a bit -- with less distance so your body can recover before taking on more miles. Cool down. Even when you get off the couch, your natural inclination is to stretch. After training, take a few minutes to cool down, stretch your muscles and shake out the tension in your legs and arms. Depending upon how serious of a couch potato you’ve been, check with your health care practitioner before beginning your training. Discuss your goals, how you plan to train and what nutritional changes you'll need to make. What Is the Difference Between a Marathon & a Half-Marathon?